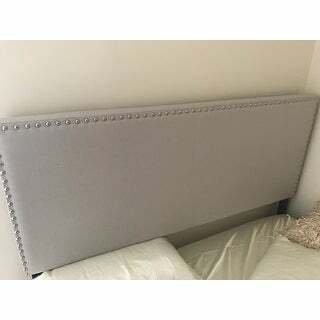 So easy to put together and the headboard is very nice looking. You may want a buddy to help a little with assembly. Streamlined design lends versatile style to this upholstered bed. Featuring individually applied chrome nailhead trim, the bed boasts a classic upholstered headboard and low-profile rails for a crisp and inviting look to perk up any bedroom redesign. Shipping was fast! We bought this for our guest bedroom. Quality is good, easy to assemble, and it looks like a khaki linen. Some folks said the beige looks like a light grey. Our room has bright lighting so it looks beige to me. We only wanted to use the mattress. Therefore, added a 1/2 inch thick ply wood sheet which helps provided strong support. Modern, clean line, and classy. Highly recommended. I ordered two queen beds for my guest rooms. The other brand cost $10 less and was superior in quality compared with this one. 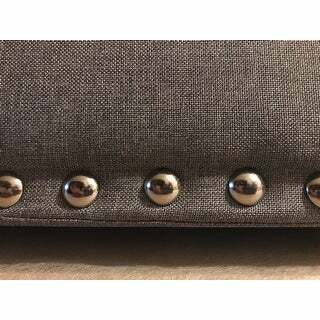 When I unwrapped the Boyd Upholstered Bed I noticed that the nail head trim seemed initially to go directly on the seam, upon further inspection I realized that the seams were all over the place on the headboard. I ultimately returned the bed due to the poor quality/sloppiness of the product. 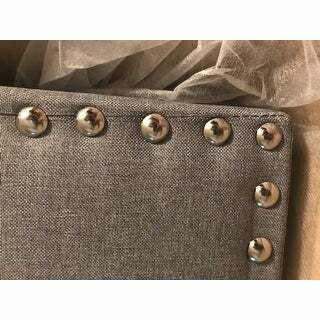 I was hesitant at first when purchasing this bed frame and headboard set. I read some reviews that weren't so great. When I received the frame, I was pleasantly surprised! It was excellent quality for such an affordable price! It was very easy to put together and instantly made my bedroom look less like a regular room and more like a luxurious hotel room! I had purchased a new mattress before I purchased this frame and I wasn't sure at first if I should purchase the box spring as well. I listened to one of the reviews on here that said you should buy or keep your box spring. My bed came out looking much higher than that in the picture of this product but I feel that it actually looks even better! Thanks to the value of this product, I didn't have to break the bank to turn my bedroom into a place that I look forward coming home to each night! Great bed overall. I bought bed in ivory but it’s definitely just a soft grey. Very neutral and will go with anything. I wish the bed came with more Plaques of wood. Only came with 4 but I bought a foam mattress and it seems to still support the mattress and myself. Over I love the bed. Very cute and stylish. We've had the bed now for about two weeks. It shipped very fast and came just about as expected. As someone else noted, the ivory is actually a light gray, but having read other reviews and from the pictures could tell it favored gray over brown. The bed is very comfortable and was fairly easy to put together. It took my husband and me maybe 20-30 minutes tops. Some of the pieces were dinged up, but not where someone would see it or where it would impact stability so we didn't think it was worth returning or raising a fuss over. Overall, we're very happy with our purchase and have enjoyed some restful nights. One thing I didn't see in other reviews and I wanted to point out, this is one where you would want both a box spring and a mattress. There are four slats which would not be enough with a mattress alone. Just wanted to pass this along in case others had the question I did and hoped I hadn't just paid for a box spring I no longer needed! 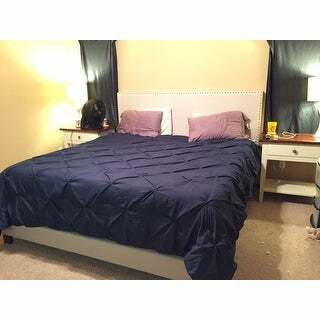 I love the sophisticated look of this bed and it was so easy to assemble the bed together. My only negative comment is the bed seems a little low without a box spring but overall, I am so happy with the platform bed. My daughter wanted a platform bed and by far this is a top quality sturdy bed. The color is a soft gray and looks heavenly. 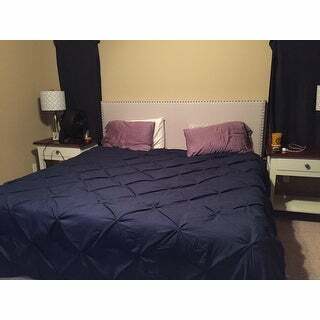 She did put both the box spring and mattress and really needed a California King size which is usually a little harder to find at an affordable price. Overstock always makes life easier! I love this bed, it looks nice and is made with high-quality material. I ordered this bed in a queen size for my teenage Daughter’s room. The quality and price was amazing and I was able to put it together myself. I ordered a 10” memory foam mattress to go with the bed, but was a little disappointed that the mattress alone will not work with this bed. I needed at least a 7” box spring to make the mattress high enough to meet the bottom of the fabric of the headboard. Overall I’m very satisfied! I recently just moved and this particular bed caught my eye! I love my clay alder home manes wood and polyester upholstered bed! thanks again overstock! It's just ok. Ivory color is disappointing and is closer to gray. Easy assembly, but does not appear or feel very solid. Would recommend checking out other alternatives. The bed is great, but this was honestly the worst customer service I have ever experienced in my life. Everything that could have gone wrong during the processing and shipping stages, went wrong. Meanwhile, Overstock was barely apologetic. I ordered the bed in Ivory. It arrived in Grey. Tried to coordinate with Overstock a return and replacement for the correct color- couldn't have been more frustrating! Ended up having to call the customer service line about 3 times. The replacement kept being canceled! They told me it was a glitch. Will absolutely never order anything from this site again. Extremely unfortunate. ***!! The “ivory” is actually a light grey in color, but I read that in a previous review which made me choose the “ivory” color for that reason. It’s a very nice bed frame for the cost. Looks like we spent a lot more than we actually did which is a plus. Our king mattress hangs over just a tad. Love the tailored look of this chocolate brown bed. It was easy to assemble and is the perfect neutral piece in a modern farmhouse bedroom. It's not going to be heirloom piece but for the price, the look is perfect! I purchased the Full Sized bed frame for my sons room. He loves it. The color matches well the the scheme already in place. I will definitely purchase from Overstock when decorating my other bedrooms. Really nice bed! Ordered 2 for my air BnB and gets lots of compliments! I can't even begin to tell you just how much I love this bed! It is the perfect platform headboard for my Tempurpedic! I looks like it cost much more than it actually did. Pretty easy to build, the slates are a bit weak so I had to buy wood planks at Home Depot to support my weight without feeling I was going to break the bed. It came in exactly as expected...delivery was great and in fact a day earlier then originally thought!! Very pleased with purchase! 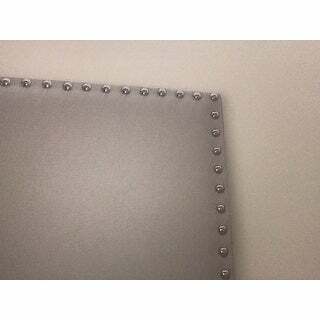 Love the detailing of the head board...stands out and looks great!!! "Does it require box spring"
"Out bed came with no instruction manual, and Overstock customer service is useless - they said they'll mail it to me in 1-2 weeks - does anyone have the instructions they can share? Such a disappointing experience." "What is the maximum weight capacity for this bed?" "What are the dimensions (L/W/H) of a twin bed?" "What is the weight limit on this bed?" 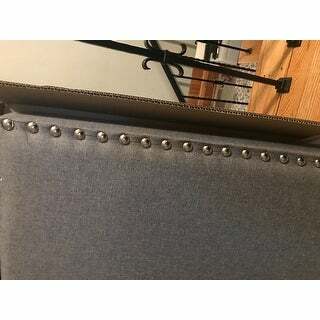 "I see there is a gap between the base and the start of the headboard. I am thinking of getting this in a king size but wondered with my mattress what or if there will be gap"